4151848 BIONICLE Trading Card Game 1: Tahu and Kopaka is a trading card game from BIONICLE released in 2001, where the player's mask moves around the map collecting the masks until they have collected all 6 and won. This is a description taken from LEGO.com. Please do not modify it. 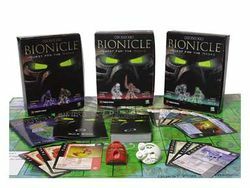 (see an archive of the product's page) The excitement of BIONICLE in a card game! Now you can live the Toa's quest for the Masks in the BIONICLE Trading Card Game! Challenge your friends as you compete to see who will survive the perils of Mata Nui and gather the Kanohi Masks. Collect all three Toa Theme Decks (each deck sold separately). Each game includes Toa, Tohunga and Turaga cards, 2 BIONICLE masks, ancient map of Mata Nui, Great Mask cards and much more. Facts about "4151848 BIONICLE Trading Card Game 1: Tahu and Kopaka"
The excitement of BIONICLE in a card game! Now you can live the Toa's quest for the Masks in the BIONICLE Trading Card Game! Challenge your friends as you compete to see who will survive the perils of Mata Nui and gather the Kanohi Masks. Collect all three Toa Theme Decks (each deck sold separately). Each game includes Toa, Tohunga and Turaga cards, 2 BIONICLE masks, ancient map of Mata Nui, Great Mask cards and much more. This page was last edited on 9 January 2016, at 14:44.